Stores in Northampton and Leicester are the first on the East Coast to sell recreational marijuana. U.S. Congressman Joe Kennedy III is calling for the legalization of marijuana across the country in a new column in the Boston Globe. "Given the rapid pace of state-level legalization and liberalization, I believe we must implement strong, clear, and fair federal guidelines," Kennedy wrote in an opinion piece for Boston Globe Media's STAT. "To do that requires us to remove marijuana from the Controlled Substances Act (CSA) and legalize it at the federal level." Earlier this year, Kennedy told Vox.com he was worried marijuana legalization could harm Massachusetts' efforts to battle the ongoing opioid epidemic. In his op-ed, Kennedy said his change of heart came as he worked with people who have used marijuana with medical benefits or who have been harmed by policies. "Our federal policy on marijuana is badly broken," he wrote, adding. "The patchwork of inconsistent state laws compounds the dysfunction. Our federal government has ceded its responsibility - and authority - to thoughtfully regulate marijuana." 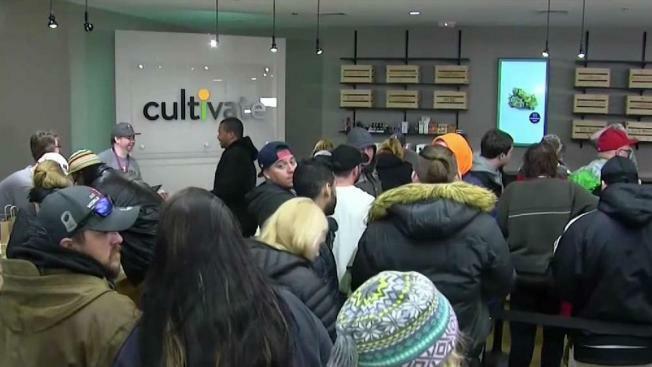 Massachusetts is the seventh state to allow recreational marijuana sales in dispensaries. Kennedy's op-ed coincided with recreational sales officially taking off on Tuesday, making the Bay State the first state on the East Coast to do so. Massachusetts' recreational marijuana law prohibits anyone under the age of 21 from buying marijuana. An individual is allowed to have up to an ounces of marijuana on their person and up to 10 ounces locked away at home. All marijuana in-store purchases will be charged an extra 20 percent sales tax.